There was NO WAY I was paying $25 PLUS shipping for a fabric crown that MAY OR MAY NOT arrive in time for my race. SOMEONE, QUICK! GET THE CAMERA! 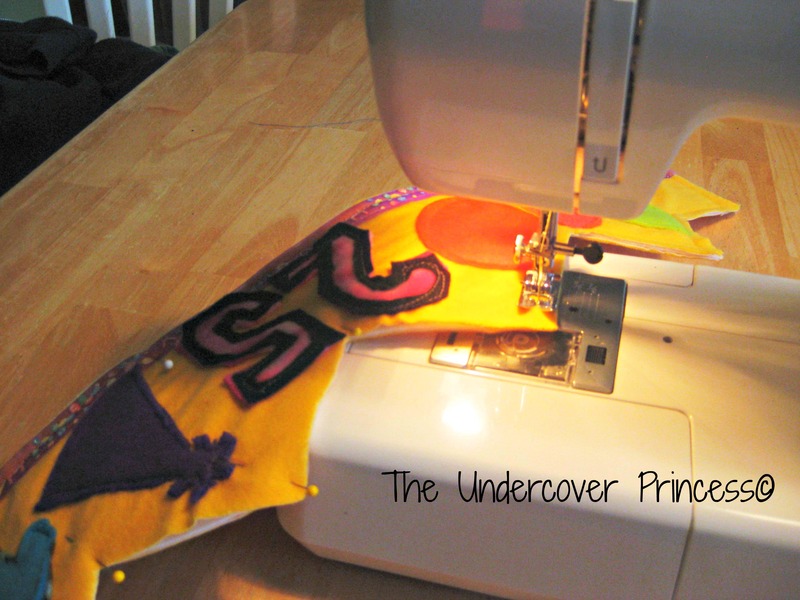 AFTER YEARS OF BEING ON SEWING RETIREMENT AND SWEARING SHE WOULD NEVER GO HEAD-TO-HEAD WITH THE SEWING MACHINE AGAIN, SHE’S VOLUNTARILY GOING TO SEW….FOR FUN! 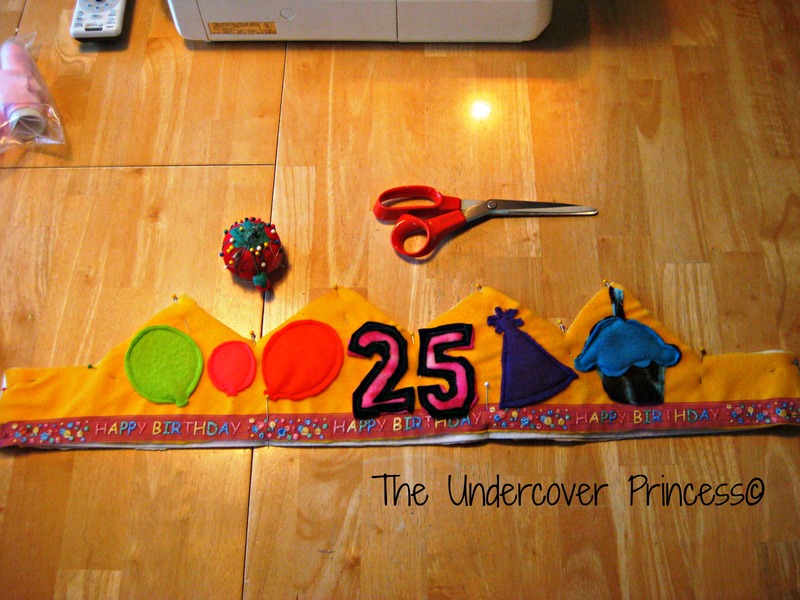 So here it is ladies and gentlemen, my step by step instructions on how you too can make your one-of-a-kind FABRIC BIRTHDAY CROWN! Use the cardboard crown from Burger King to measure the circumference of your head. Tape together computer paper until you have the desired length. Then draw out the design for your crown on the paper. 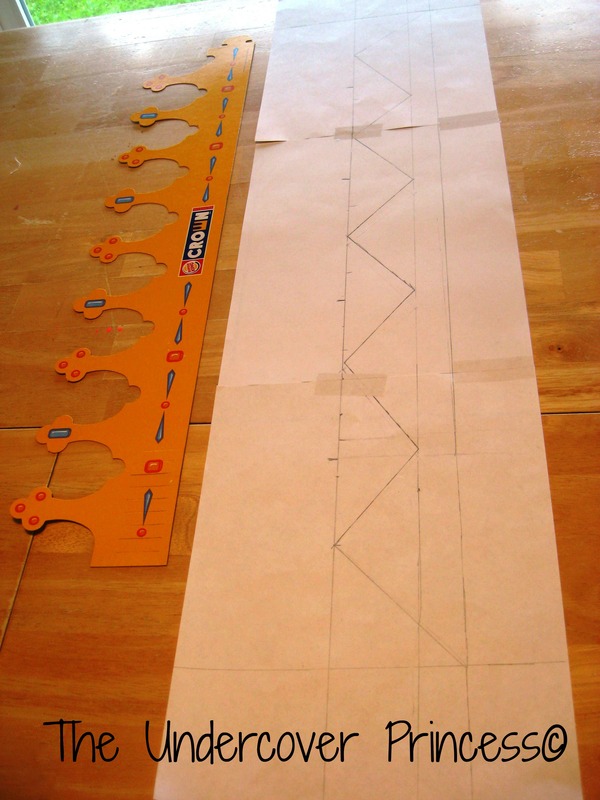 You are creating a pattern to use when cutting out your fabric. When you have a design you are happy with on paper, cut it out. Once again, use this pattern to measure around your head. It never hurts to double or triple check the sizing. 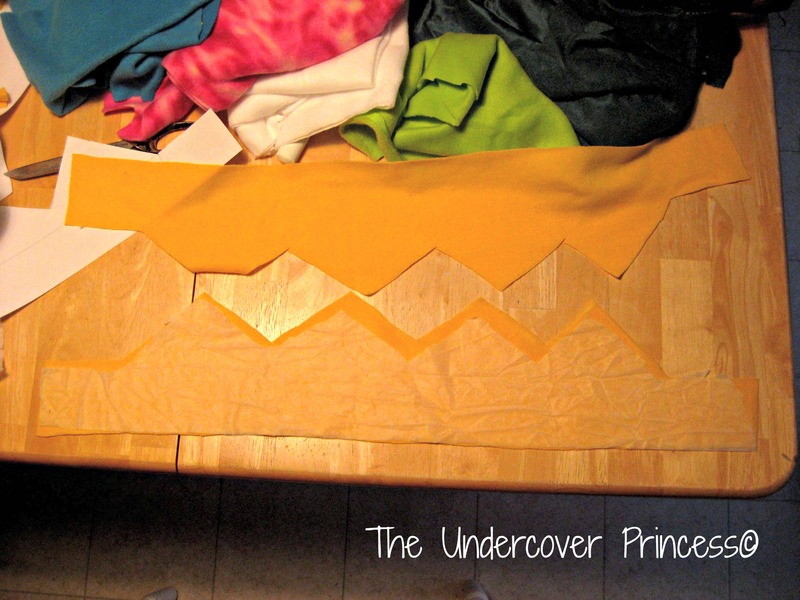 It took me two paper patterns before I got the sizing perfect for my crown. 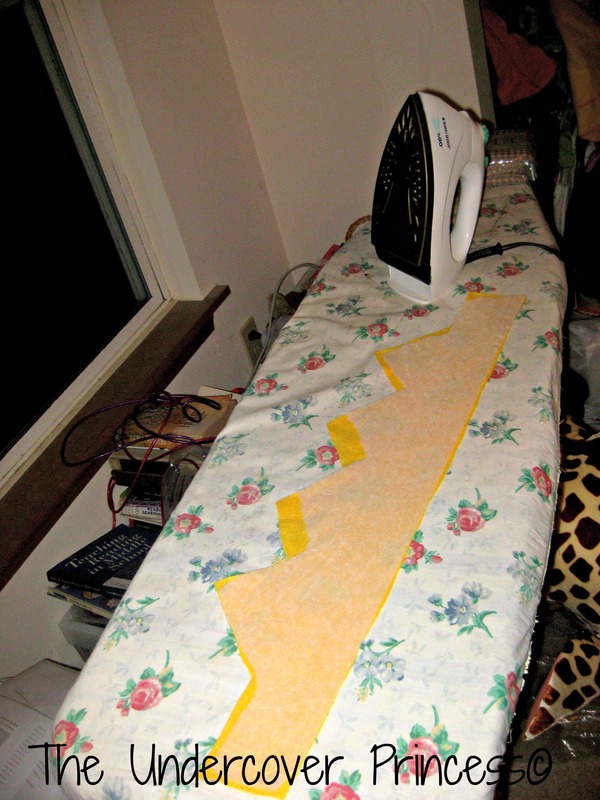 When you are satisfied, lay it out on your fabric. You can either trace around it with chalk or use pins to keep it in place while cutting. (I used chalk because I didn’t feel like locating straight pins.) You will need two pieces – a front and a back! 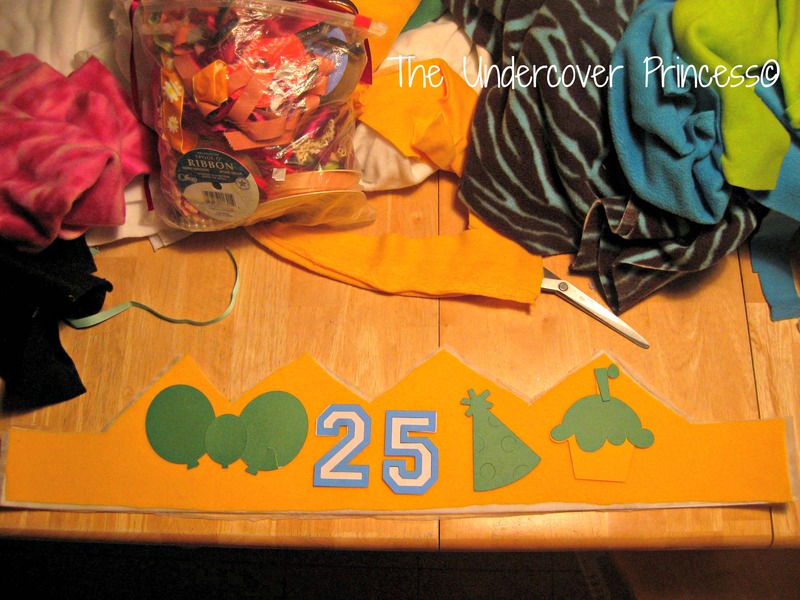 Using the same paper pattern, cut out your interfacing. 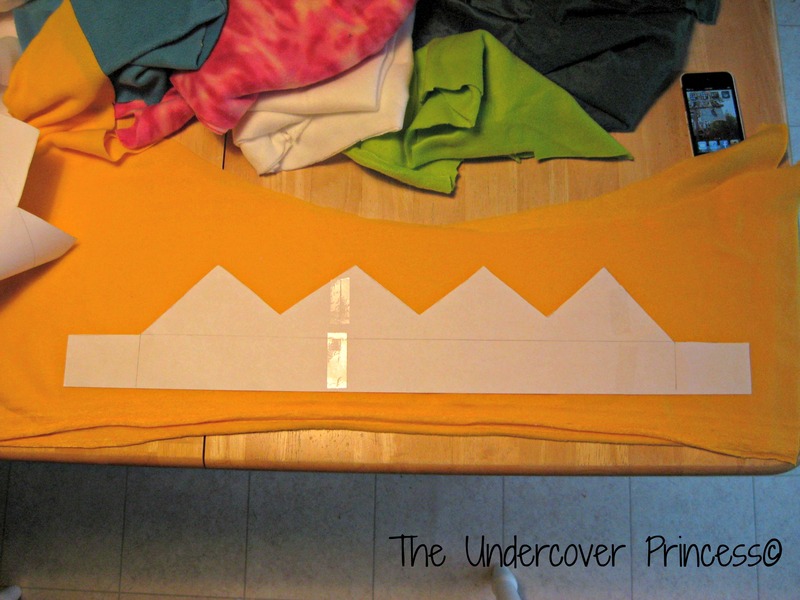 To make sure my crown was stiff enough to stand on it’s own while it was on my head, I cut out 4 layers of iron-on interfacing (2 for the inside of the front piece and 2 for the inside of the back piece) and 1 layer of the heavy duty sew-on interfacing for the middle layer. Figure out the designs you want on the outside of your crown. My mom cut me these paper patterns using her Cricket and various Cricket cartridges. Lay everything out so you can get the spacing and sizing right. You guessed it! 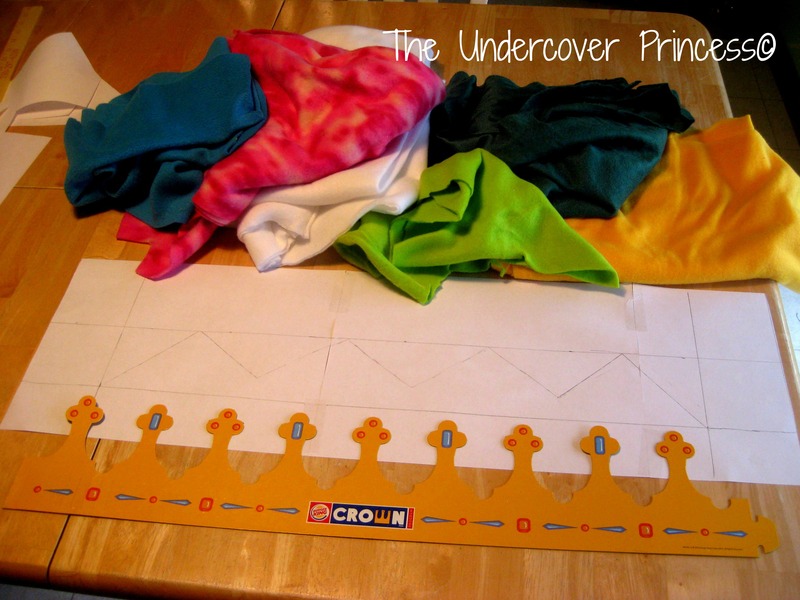 Once you have the pattern pieces for the designs for the outside of your crown, it’s time to pin them to the fabric and cut them out. You could also trace using chalk if you’d like. 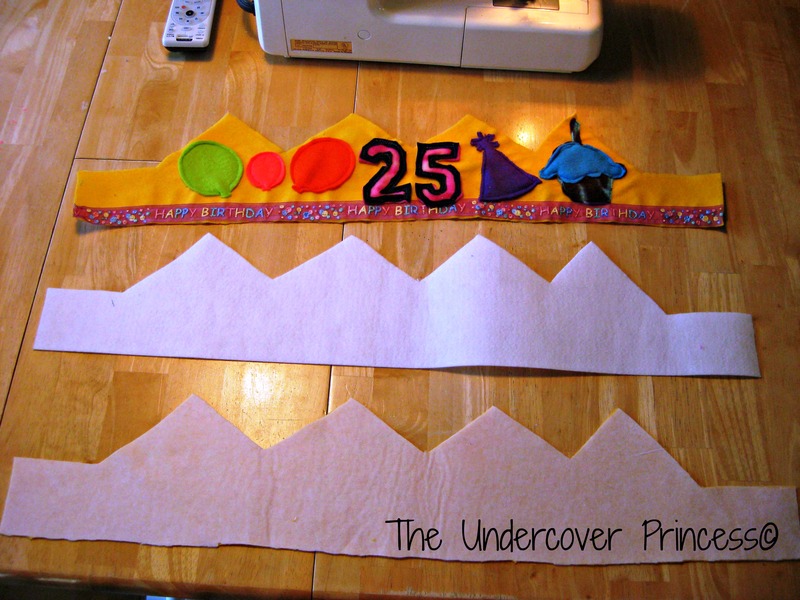 Pin the designs (and ribbon if you chose to include some like I did) to the front piece of your crown. You will sew these down BEFORE you sew all the layers of your crown together. 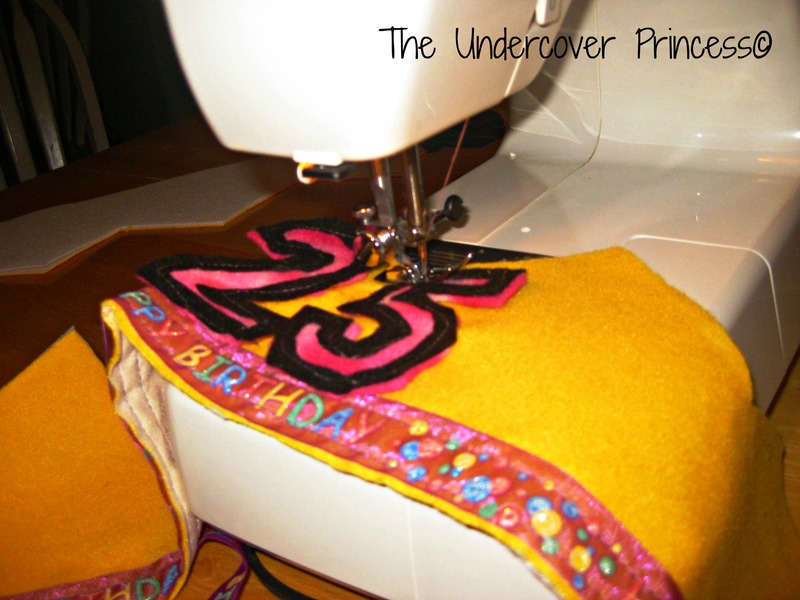 Carefully top stitch around the designs. Once again, you should be sewing these to the front piece of your crown ONLY. 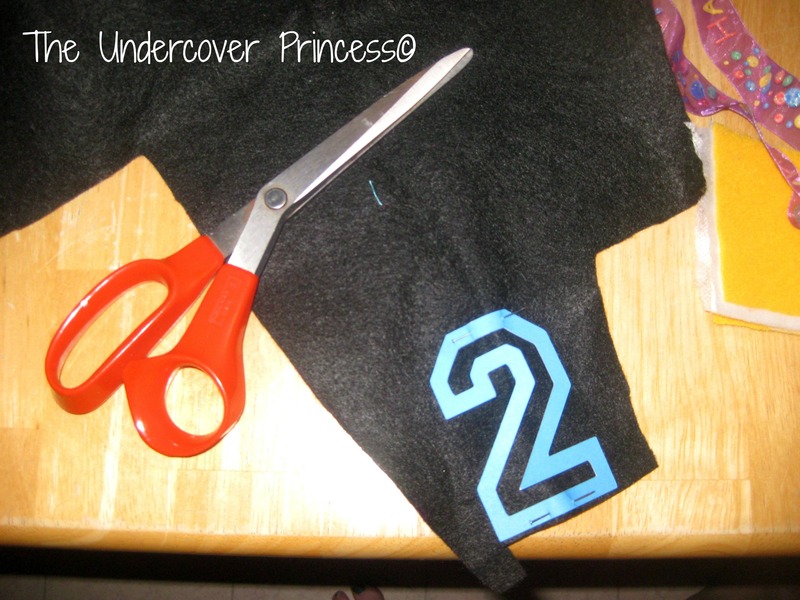 Word to the wise, if you are going through multiple layers of fabric as you see here with my 25 (pink and black), sew those two pieces together FIRST then sew that one piece to the crown. 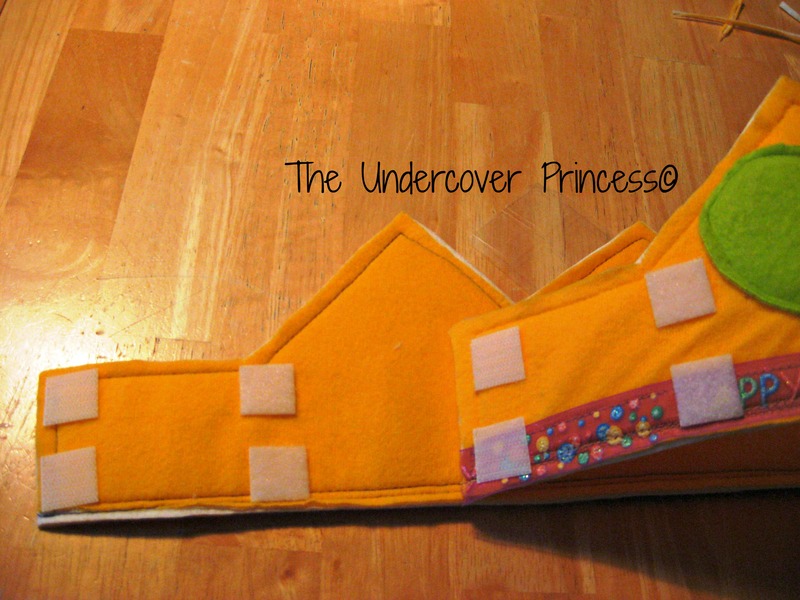 It will make it easier for you to keep everything lined up and provide an extra layer of stitching as reinforcement. Slowly and carefully, sew these three layers together. You may need to take the pins out one at a time as you come up to them with the sewing machine. To make sharp point turns on your crown, stop at the point where you want the corner with the sewing machine needle all the way down into the fabric. Lift the presser foot (the flat silver piece that slides over the fabric) and turn the fabric until you have reached your desired angle, then put the presser foot down and continue sewing. When you have gone all the way around the crown, I recommend back stitching just to reinforce the seam. For my crown, I decided the best way to keep it on my head securely during my race was to use Velcro squares. These squares had a sticky, adhesive back that allowed me to position them just right (this took a couple trial and errors before I had the spacing and proper fit for my head). Make sure the pairs of Velcro are on opposite sides of your crown so that when you go to stick them together they will form a circle with the Velcro pieces meeting in the middle of the front and back pieces of your crown. 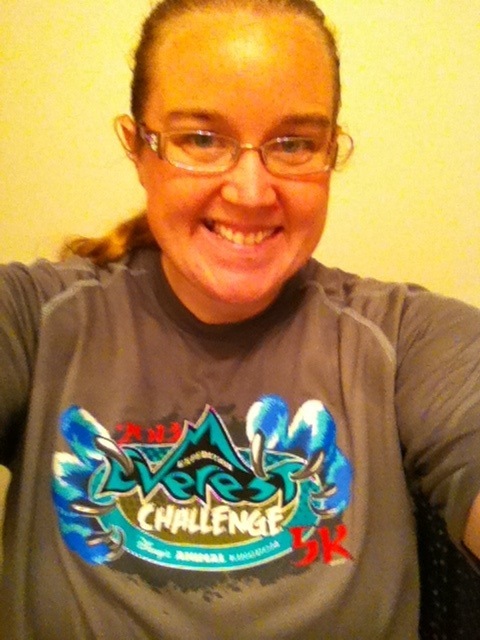 Then I sewed down each individual square because I didn’t want them falling off during my race. 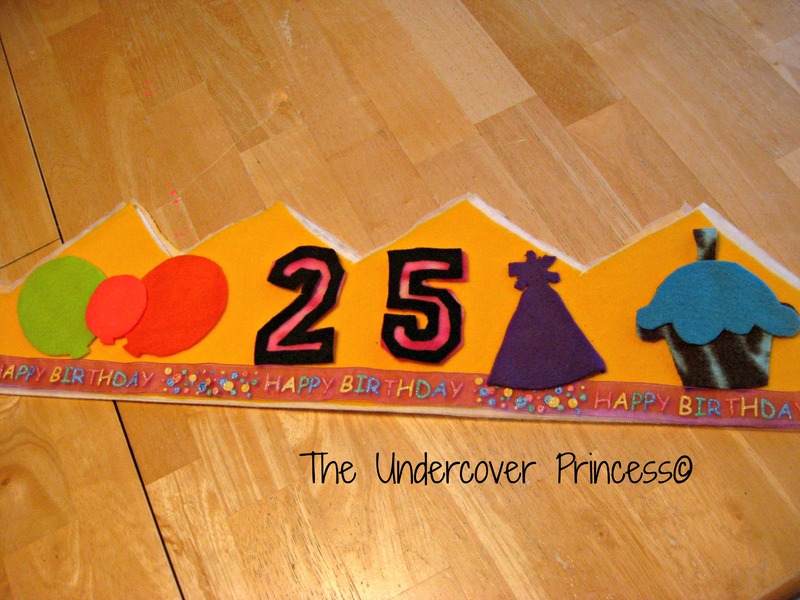 Now if you think your crown needs a little extra pizzazz, you can decorate it with puffy paint! (See photo) And that’s it! 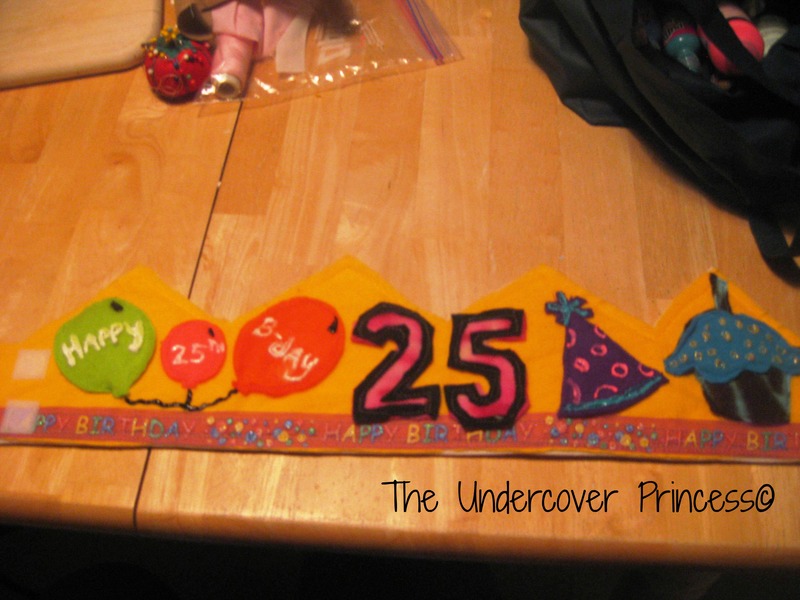 You have yourself one custom made, totally unique, birthday/celebration/because you are royalty and deserve it fabric crown! In all, this took me maybe 10 – 12 hours total to make. I worked on it a few hours each night after work the week leading up to the race. I even had it finished a day early so I could take it to work on Friday to show my coworkers who couldn’t fully grasp the craftiness I was trying so desperately to explain. I hope you’ll give this a try sometime, and when you do, post a link to your photos so I can see how your special crown turned out! 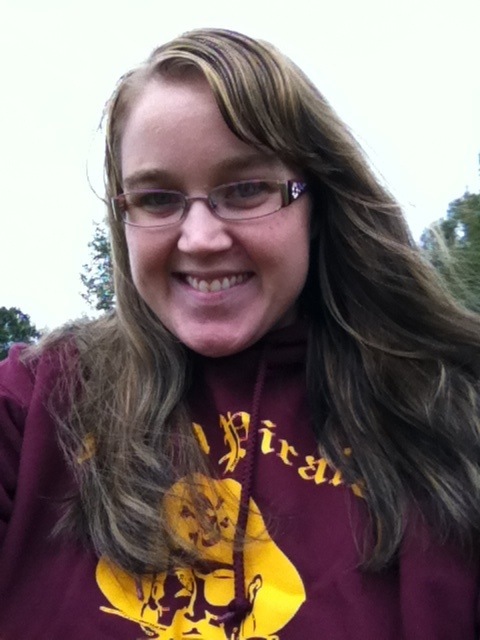 Here it is, a photo of me ready for the high school football game in 60 degree and rainy weather. This is also the last photo of 24 year old me as tomorrow is my BIRTHDAY! 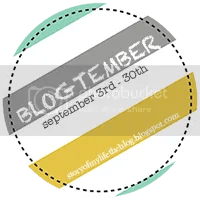 Blogtember theme – Describe a distinct moment when your life took a turn. The moment that comes so suddenly to mind would be the day I was accepted into the Disney College program three years ago. Check out this post from my old blog to read about my journey to becoming a cast member. My time as a cast member, just shy of one full year, changed me. While there I learned to live with roommates, something I’d never done before, learned to budget, cook and manage my time. 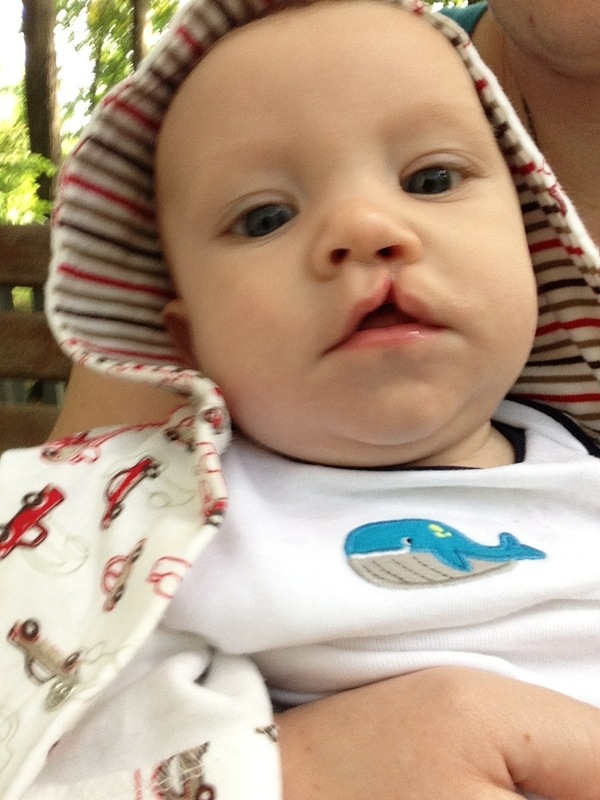 I became more responsible knowing my parents weren’t there to fall back on. I began to overcome my shyness, at least on-stage. Every time I was in my costume I reminded myself I was wearing my “show shoes” and that meant it was time to play a character. For my entire shift I was someone else, someone outgoing. I saw a different, more confident side of myself. 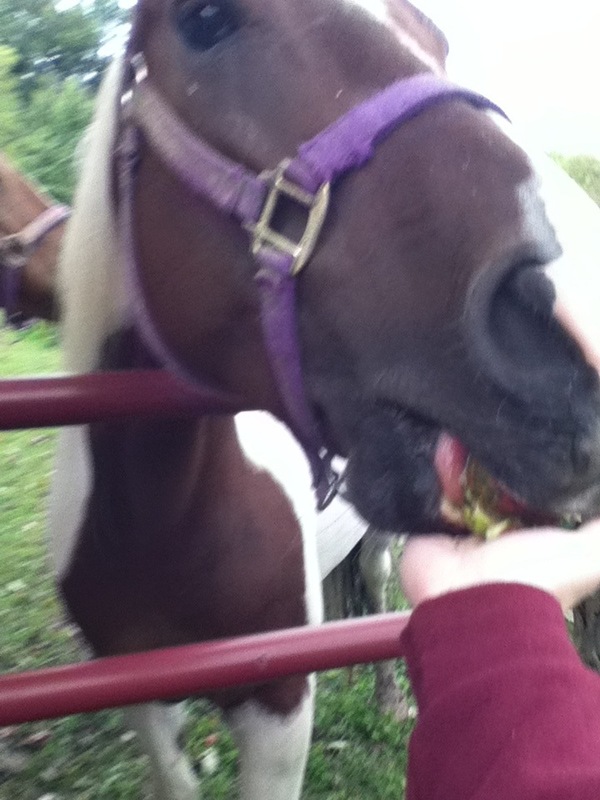 I fell in love, had my heart-broken a couple of times and met my best and closest friends. My time there was not just fun and games either, I took four classes for college credit and networked. I knew even then that when I eventually came home to finish my degree (which I did last August, has it really been a year already?! Yikes the time sure does fly!) that I wanted to return to work for The Walt Disney Company©. I had the opportunity to meet people from around the world, to hear the stories and career journeys of some of the Disney legends. I saw where these people where and I envisioned myself there, too. For a short while I was part of the magic. Nothing can describe seeing someone’s face the first time they walk down Main Street U.S.A. and see Cinderella’s Castle or watch “Wishes,” Magic Kingdom’s nightly fireworks show. I was forever changed because I witnessed the magic. I made the magic. I saw the wonder and joy on the guests faces, even when they were less than pleasant to the cast members. There are no words to describe the effect working there has had on me, but I can say that it restored my hope that there is some love and magic and happiness still left in the world, because it didn’t matter how bad my day was as long as I was able to bring a smile to at least one guest’s face. To visit Walt Disney World as a guest is one thing and to work there is something completely different. It takes a lot of people and a lot of work behind the scenes to make the magic possible and every day I long to return. And it’s a dream I refuse to give up, no matter how long it takes me to achieve. I know where I belong and I will do just about anything to make it a reality. Let’s dig a little deeper and find out what this REALLY means…. Well then, that’s a case book description of me to the T if I’ve even seen one. Usually self-expression comes more easily to INFJs on paper, as they tend to have strong writing skills…. Okay, now this is just getting freaky…. INFJs are effective in occupations involving substantial intellectual work, caring for other people, and requiring creativity. INFJs build successful careers in a broad range of organizations. Social and community care services, counseling, teachers of humanities and social sciences, healthcare workers (both in administration and in medical services), various service-oriented professions as well as religious services and social movements are just some of the examples of occupations favourable to INFJs. In my job, I work in the Public Relations Department at the local hospital. I spend a good amount of my time designing things for our social media pages and I have some various graphic design projects in the works for different departments, so I guess I am true to what it says. I am doing something that lets me showcase my creativity.